The NICOMATIC CMM 320 Mixed Interconnect system is a 2mm pitch connector with 3 rows of signal or mixed contacts, HF or HP. Available in male or female from 6 to 120 contacts, or up to 15 HF or HP contacts (Series 30) with proven high reliability under the most extreme environmental conditions like aircraft electronics and rail transport systems. 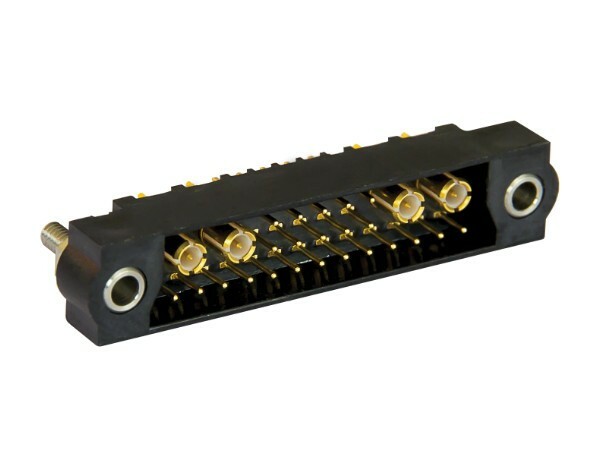 The NICOMATIC CMM 320 Mixed Interconnect system is a 2mm pitch connector with 3 rows of signal or mixed contacts, HF or HP. Available in male or female from 6 to 120 contacts, or up to 15 HF or HP contacts (Series 30) with proven high reliability under the most extreme environmental conditions. The Nicomatic CMM range was designed for use in aerospace, instrumentation and control, military and transportation sectors with applications to date including IFES, HUD, flight controls, FADEC units, radar, missiles, optoelectronic sighting systems, space satellites, mobile radios, power supplies, UAVs and engine controls. Nicomatic CMM320 series with series 30 special contacts are mateable and drop-in replacements for Harwin 3-Row J-Tek and Mix-Tek Datamate. The two ranges are comparable in fit, form and function. Contact replacement in insulator: 50 cycles for HF/HP 30 series, 5 cycles for HF/HP 22 Series. The Nicomatic CMM micro-connectors high reliability under the most extreme environmental conditions of use ~ vibration, shock severity, high temperature (250°C for 1000 hours exceeding the 85°C per the MIL), humidity, salt spray, corrosion and high altitude (70,000 ft) has fulfilled the most rigorous requirements under the MIL-DTL55302F qualification test routine and EIA test procedures. The high level of modularity in the CMM320 mixed layout family makes them especially suited for space and weight-contained applications such as unmanned aircraft. Nicomatic has developed back potting services and shapes as a fast, flexible and reliable solution for harness protection in the CMM Connector Series. These backpotting solutions provide protection from moisture or debris to the contacts while offer strain relief to the wire and cable as an effective alternative to overmolding or backshells. CMM320 and CMM340 use extended walls in the housings allowing them to be filled and protect terminated contacts.